Not all chips have to be deep fried, oily and greasy -they can also be healthy and good for you. 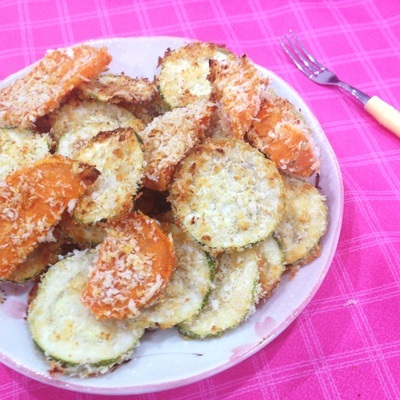 These Oven Baked Vegie Chips are a great way to encourage the kids to enjoy their vegetables and get them involved in cooking too! Preheat oven to 180°C, line a baking tray with foil and lightly grease with olive oil spray. Wash and thinly slice the zucchinis. Cut the sweet potato into wedges. In a large bowl add the breadcrumbs, parmesan cheese and garlic salt. Season with salt and pepper and combine well. Pour the milk onto a plate and soak the vegie chips in the milk. Repeat with all the vegie chips and place on the prepared tray.